"Very filling and even a little naughty, this butternut squash soup is a decadent appetizer. Butternut squash is hearty on its own, but the coconut milk makes the mixture truly rich. Serve with a warm baguette." Place butternut squash in a baking dish, flesh side up. Brush 1 tablespoon melted butter over the flesh and top with 1/2 teaspoon salt, 1/2 teaspoon pumpkin pie spice, and cayenne pepper. Roast in the preheated oven until tender, about 1 hour. Remove squash from oven and cool for 15 minutes. Place a large stockpot over medium heat; add 1 tablespoon butter. Cook and stir onion in the melted butter for 2 minutes. Add curry powder; cook and stir for 1 minute. Stir in coconut milk; bring to a boil. Scoop flesh from the butternut squash and add to coconut milk mixture; mix in remaining 1/2 teaspoon salt, 1/4 teaspoon pumpkin pie spice, vegetable stock, and 1/4 teaspoon nutmeg. Bring to a boil, reduce heat to low, and simmer until soup is heated through. Blend soup using an immersion blender on low speed. Simmer until soup is smooth and thickened, about 20 minutes more. Add more vegetable stock for a thinner consistency and season with salt. Ladle soup into bowls and top each with pepitas and a pinch of nutmeg. Needs to be a bit more spicy. Also, adding some potato would make it a bit more filling and less sweet. 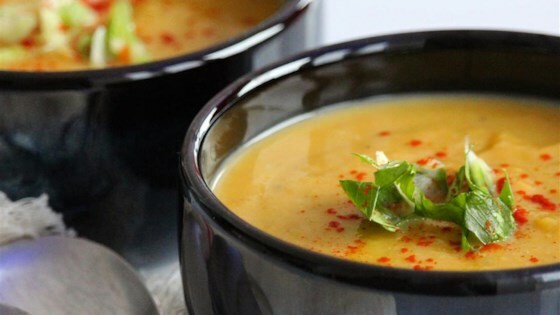 This is the best recipe for butternut squash soup ever! It was a huge hit everyone loved it. The only change I made was to add about 2 tablespoons of fresh grated ginger. Amazing! Made exactly as written...my husband loved it so much that I'm making it again this week. The flavours were outstanding. Thank you for a great recipe! Made the recipe just as published and it is wonderful. Will make it again! First time and I will do again and again....curry, nutmeg,cinnamon go perfect. I tried this also with sweet potatoes. Easy to make and delicious exactly as written (except that where I live, coconut milk comes in 14 oz cans). The immersion blender made it a nice, smooth texture. Super easy and delicious! I used frozen cooked butternut squash instead of baking my own. I put all the spices in at once when I added the squash to the milk mixture. Seriously simple (and I don’t cook a lot) and came out great! Had made it to take to work with me but I already ate it all so will have to make another batch! Thanks!